Noodles & Co. has opened a location in Moorestown (1540 Nixon Dr., 856-780-1987). Gluten-free fusilli, pad Thai and several salads are options. My family and I just ate there last weekend and were told that the rice noodles are prepared in advance in separate water. In Phoenixville, New American restaurant Marly's BYO (106 Bridge St., 610-933-7471) can accommodate gluten-free requests. 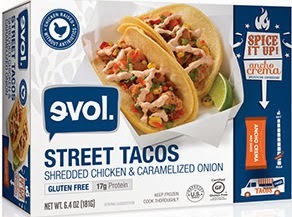 Evol Foods' newest line of "street tacos" include three gluten-free varieties: Sweet Potato, Black Bean & Goat Cheese (sweet potatoes, black beans, goat cheese, roasted corn, cilantro and jalapeños on corn tortillas and served with a pouch of salsa verde); Uncured Bacon, Potato & Poblano Pepper (uncured bacon, roasted potatoes, poblano peppers, roasted tomatoes, caramelized onions, cilantro, jalapeños and cheddar cheese on corn tortillas and served with a pouch of chipotle crema); and Shredded Chicken & Carmelized Onion (guajillo chicken, roasted tomatoes, caramelized onions and roasted corn on corn tortillas served with a pouch of ancho crema). The street tacos are on sale this week at Target for $3.50 per two-pack. Pasta Flyer, the fast-casual gluten-free pasta concept that raised money through Kickstarter this summer, is coming to Philadelphia in early October. In addition to several pasta pop-up events in Old City and University City, Old City's Fork will host a collaboration dinner on October 2 with Mark Ladner of Pasta Flyer (and Manhattan's Del Posto) and Eli Kulp of Fork. Early seatings will be staggered between 5:30 p.m. and 6:30 p.m and later ones between 8 p.m. to 9:15 p.m. Call the restaurant at 215-625-9425 for reservations. Main Line Health is sponsoring three gluten-free events this month. On September 22, the Chester County Library in Exton will host a discussion group where gluten-free cooking and nutrition tips will be presented, and later that day the Celiac Center at Paoli Hospital presents a seminar on "mindful eating." On September 30, there will be a gluten-free cooking demo at Wegmans in Malvern, where Dr. Keith Laskin, the Director of Paoli's Celiac Center, will host a Q-and-A session after the demo. Reservations are recommended for all three events.